They say the past is a different country. The past is also a different city, at least if the June 1983 Texas Monthly Houston listings / city guide is any indication. The Bayou City of 30 years ago might as well be Timbuktu, so strange and exotic were its ways. Most striking is the nightlife. Yes, of the 25 bars and clubs listed, a few establishments remain, albeit most changed utterly in spirit. Rockefeller’s, then a showcase of “national and regional musical acts of every type,” is now a high-end function room. Sam’s on Richmond is now known as Sam’s Place (and adjoins the notorious Sam’s Boat). Back then it was a hot-spot for “urban cowboys and preppies, post-college on up.” Who seemed easily impressed: “It’s easy to be loyal when the chips and salsa are always forthcoming from the kitchen in ample baskets.” The Carillon Center Sherlock’s Baker Street Pub still stands, but it seems unlikely that much of today’s bro-tastic clientele convenes there to discuss antiques, as the clientele of 1983 was reportedly wont to do. Two of the places seem more or less unchanged. Then as now Anderson Fair was a folk / bluegrass club with uncomfortable chairs, and then there's soon-to-reopen Marfreless : “Definitely not a pick-up joint, this dimly-lit club has an upper tier lined with seductively soft sofas that we wouldn’t occupy with anyone we didn’t know quite well.” Hubba hubba. Others have been vaporized, are as lost as the planet Alderaan. A CVS now occupies the Waugh at West Dallas address of Metropol, a “big sleek room with mirrors and a lot of vinyl booths” featuring “stylish customers who put on a real show.” Celebration, a Galleria-area disco on West Alabama is now a parking lot. In its heyday it sported a “sleek” and “basically high-tech” dance floor “under a battery of blinking lights,” and…drum roll please…a game room. Big box retail has also apparently spelled doom for both forward-looking Echo Beach and nostalgic Rockabilly’s, an odd pairing of adjoining establishments anomalously situated on the frowsy corner of North Gessner and Kempwood. The latter’s name said it all about the goings-on within; Echo Beach was described as a “new wave club,” with little further explanation by Texas Monthly's scribes. 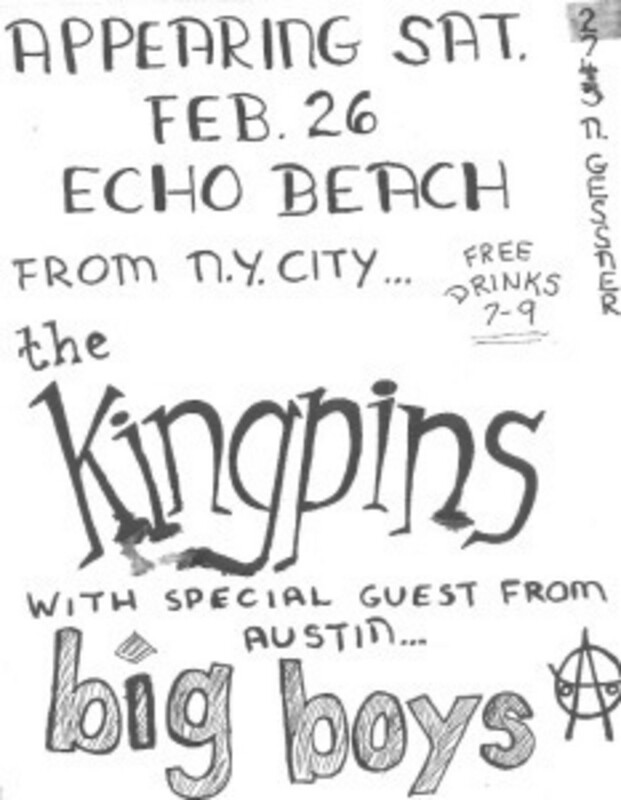 Save for a show in which Austin’s Big Boys opened for NYC’s Kingpins there, Echo Beach seems to have left little trace of its existence on Texas’s punk and new wave history. A few places have been recycled. Quasimodo’s Sanctuary—a quiet bar sporting a Count Basie / Benny Goodman soundtrack—has been reborn as Mockingbird Bistro. Lott’s Emporium, a Third Ward bebop club with an interracial clientele co-owned by Texas Tenor sax legend Arnett Cobb, now houses the Eta Rho Sigma chapter of TSU’s Phi Beta Sigma fraternity. Jack and Hector’s Piano Bar out in Memorial, “inelegant but comfortable,” is today’s First Tee Pub, which bills itself as “West Houston’s neighborhood pub.” Today’s Under the Volcano was yesteryear’s Munchies, featuring live chamber music and wind ensembles and “delicious rye bread sticks.” P.J.’s Sports Bar on West Gray has always been the most atypical of sports bars; so too was its predecessor on the site: Las Brisas, a Tex-Mex café fused with a jazz joint in which you could chow down on flautas and bliss out to Mingus Ah Um at the same time. Sometimes the name changes but the ambience remains much the same. In 1983, 4608 Westheimer was occupied by a place called Remington’s, where "starched young professionals congregate after work and don’t let up until singer Scott Gertner has done his last Stevie Wonder tune.” Gertner is gone to greener pastures, and the Remington prints have been stripped from the walls, but that building today houses Sullivan’s Steakhouse, where the clientele is still plenty starched if not as young. Rock music videos? On tape? On a giant screen? Waitresses in leg-warmers and pastel minis? Freaking balloons, jugglers and male dancers? The first hipster to open a joint like that today would become the irony era’s Steve Rubell. Bentley’s lived up to its name. “A $180,000 1949 Bentley right there alongside the dancers establishes this club as numero uno among the vintage car-theme bars tearing up the tracks around Texas.” Like we said before, back then, people were easily amused, especially the sort of proto-douchebags who would go to a club to gawk at a fancy car . Bentley’s was in Woodlake Square (corner of Westheimer and Gessner) and would end up as a hip-hop club for a time. And my how the tenor of the times has changed. Today, we Houstonians break our arms patting our own backs and shout ourselves hoarse about our LESBIAN MAYOR!, but back then, that was still a love that dare not speak its name. Like so many of the other places, Kindred Spirits is gone. It stood next to the Luby’s on Buffalo Speedway and the whole shebang was bulldozed to make way for H-E-B’s parking lot.